As we first discuss what is Merger? A merger is a combination of two companies combines to form a single company. A merger is similar like an acquisition or takeover the only difference is in merger existing shareholders of both companies involved retain a shared interest in the new corporation while in acquisition one company purchases a bulk of second company’s stock by willingness or unwillingness of another company. 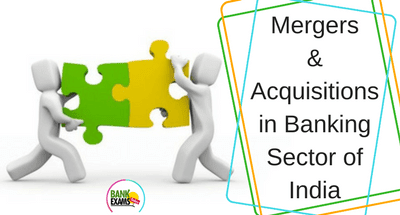 In the last few years banking sector has witnessed many tremendous mergers and one of the most prominent mergers is a merger of ICICI Ltd. with its banking arm ICICI bank Ltd. the merger of Global Trust Bank with Oriental Bank of Commerce and the merger of IDBI with its banking arm IDBI Bank Ltd. Through mergers, it will help the banks to scale up its business and gain a large no. of customers quickly. It also helps to fill the business gap, to empower the business to fill product or technology gaps and being acquired by the big business firm it will help to upgrade its technology platform efficiently. It will bring better efficiency ratio to the business and banking operations and minimize the risk factor ratio by merging into one. It will also help in upgradation of technology, increase in profit and raise the standard of living. The foremost disadvantage is compliance and risk consistency and both the merged organizations have different perspective of thinking, different risk culture so it creates a negative impact on the profitability of the organization. Another disadvantage is a poor culture fit as the bank only consider the perspective of merging on papers not consider their people or culture into account this is the reason why many bank mergers ultimately fail. Amalgamation of two banking companies is under the provisions of Section 44 of the Banking Regulation Act,1949.